Rhodium Plated Sterling Silver (Wt 40 Gram] EON 1962 Swiss Movement (Tanzanite, Peridot, Diopside, Garnet, Citrine and Swiss Blue Topaz) Watch in 12.274 Ct. The EON 1962 multi-gemstone bracelet watch (Size 7.5) has been crafted with patience out of sterling silver and plated in the smooth finish of Rhodium. The collector series watch packs in a combined gem weight of 12.274 Carat. The conceptualizing and designing itself consumed over 3 months, while procurement of stones took four months. Victorian appeal has been beautifully seamed with the rainbow theme of silver (40 Grams) watch powered by Swiss movement. Mozambique Garnet Round 4 Faceted 3 0.990ct. Rhodolite Garnet Round 4 Faceted 3 0.990ct. Hebei Peridot Round 4 Faceted 3 0.900ct. Swiss Blue Topaz Round 4 Faceted 2 0.600ct. Tanzanite Round 4 Faceted 2 0.530ct. Russian Diopside Round 4 Faceted 2 0.500ct. Citrine Round 4 Faceted 3 0.750ct. Russian Diopside Round 3 Faceted 4 0.600ct. Rhodolite Garnet Round 3 Faceted 4 0.600ct. Swiss Blue Topaz Round 3 Faceted 4 0.570ct. Hebei Peridot Round 3 Faceted 8 1.000ct. Amethyst Round 3 Faceted 8 1.494ct. Tanzanite Round 3 Faceted 4 0.500ct. Mozambique Garnet Round 3 Faceted 8 1.000ct. 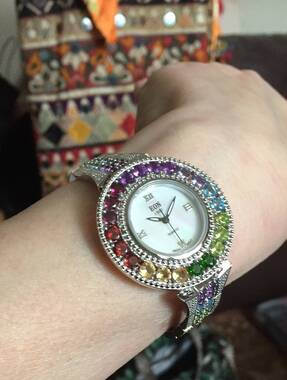 Verified reviews of EON 1962 Swiss Movement Multi GemStone Bracelet Watch (Size 7.5) in Sterling Silver 11.780 Ct.
Hard to put in but I still love it.